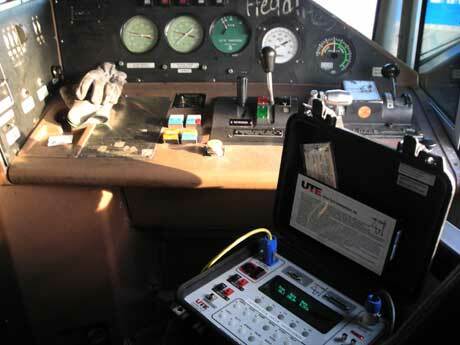 Ultra Tech Enterprises | Cab Signal Master | Railroad Testing Equipment Welcome to Ultra-Tech Enterprises, a Railroad Testing Equipment Provider in Punta Gorda, Florida . Cab Signal Master is a microprocessor based system specially developed to test all cab signal equipment in railroad locomotives and transit cars. Programmable default settings and straight forward operations allow simple "plug it in, turn it on" operation with very little instruction. The large easy-to-read display and weather-proof controls provide a rugged user interface. 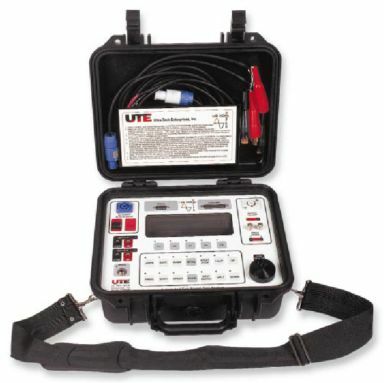 The portable tester accurately simulates both cab signal code rates and speed signals simultaneously and can measure loop current while coding. The test system can be configured to automate tests. Portability The tester is housed in a "railroad tough" portable case with shoulder strap for in the field usage. Everything you need is provided including cables. Accuracy The tester provides accurate and repeatable test results while simulating both cab signal code rates and speed signals simultaneously. Loop current is measured and displayed while coding. Easy to Use The tester features a large, easy to read illuminated display. The unit is not only easy to use, but features built-in help menus. With Cab Signal Master, no other tools are needed except a power source and a current loop. Flexibility The tester features two measuring inputs, AC or DC, and has a wide range input power source, 30 VDC to 90 VDC. An optional AC power adapter is available. For even greater flexibility, it has three different modes of operation --- factory, customer, or user defaults for testing efficiency. Send mail to info@ute-inc.com with questions or comments about this web site. Copyright © 2016 Ultra-Tech Enterprises, Inc.